Much like regularly changing a vehicle’s oil and rotating its tires, bowhunters must winterize and thoroughly inspect their hunting gear after the season to ensure its longevity. Dan Ellyson, co-owner of A1 Archery in Hudson, Wisconsin, says winterizing your hunting equipment is essential preventative maintenance. Richard Johnson III, general manager at Hall’s Arrow Inc. in Manchester, Connecticut, agrees. Start the process as soon as your season ends, when the thought is still fresh. Catalog your gear to familiarize yourself with the actions needed. Lubricate all friction points (such as cams, limb pockets, roller guards, etc.) with an oil pen. Most high-end bows have sealed-bearing systems and don’t need lubrication as much as bows with open plastic-bearing systems. There’s no need to relax a compound bow’s limbs by dropping the poundage. Store your bow in its case or hung up. A recurve is best stored unstrung. Wax, but don’t over-wax, the strings and cables so they don’t dry out and break. Check for wear and tear such as broken strands and serving separation. Replace every two to three years to keep the bow’s performance where it should be. If you don’t have time to give your bow basic service, take it to an archery shop. Most shops offer cleaning services for around $50. An expert disassembles your bow, wipes away dirt and dust, lubricates it, reassembles the cleaned pieces, and retunes it. Inspect for loose fletching, broken nocks and cracks in the shaft behind the head and in front of the nock. If you use carbon arrows, check for frayed fibers. Discard arrows with cracks, frays or chipped carbon fragments. They can be dangerous. Remove broadheads that were shot into animals to prevent dried blood from getting into threads or arrow shaft. Wash and dry your bowhunting clothes. Store them in an air-tight bag or container to keep out bugs, pets, moisture and household odors. 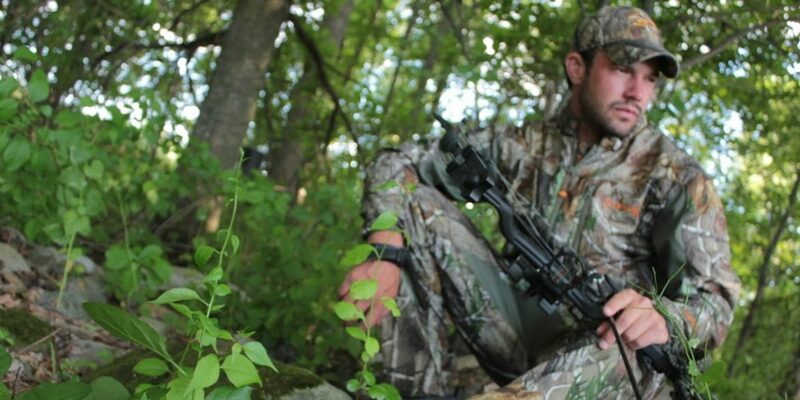 Ellyson and Johnson handle treestands differently. Johnson recommends removing all equipment from the woods during winter. If you don’t, trees will start growing around the stand’s attachment ropes, chains, straps and other devices. Animals also chew on seats, ropes, back cushions and other materials. Ellyson said removing treestands can be a huge project for some hunters, and advises they thoroughly inspect their stands before crawling back into them if they leave them out between seasons. He urges hunters to regularly level and reposition stands, double-check their straps for damage and security, and ensure bolts and ladder sections didn’t come loose. Choose whatever method makes sense to you. And if you store your gear between seasons, be sure it’s not exposed to moisture, or extreme heat or cold. Taking these steps prolongs the life of all your hunting equipment, and reduces the odds of future problems. That adds up to great money savings with two huge side benefits: safer hunts and reliable gear. And who doesn’t want that?